Attentive Source readers should not be surprised that I attended Games 3 and 5 of the ’75 World Series, which is widely considered one of the more dramatic Fall Classics. My hunch is the Dodgers-Red Sox matchup beginning tomorrow in Boston will be a pretty good one, too. The Red Sox have the better hitting and fielding, the Dodgers the better pitching. If the Dodgers’ starting pitching holds steady, I think they win it in five games. Remember, I grew up in Cincy in the 1970s when the NL West was a perennial steel cage match between the Reds and Dodgers. So consider: 1) I am not inclined to give Blue the benefit of the doubt, and; 2) I am also a Bengals fan. Meaning: I may have no business writing about any of this. But I can tell you this: traffic to Games 3, 4 and 5 (if necessary) at Dodger Stadium will be almost certainly be terrible. I rode the Dodger Stadium Express to and from the ballpark during last year’s Series and was surprised how many people were sitting in their cars parked in gridlock on Sunset Boulevard while Metro’s buses were whizzing by en route to the ballpark in the bus lane. The Dodger Stadium Express provides free rides to the ballpark to game ticket holders from Harbor Gateway and Union Station. All the details are here. We’ll be seeing you Friday, baseball fans! The Metro Board of Directors on Thursday will also consider a motion offered last week to provide free Metro bus and train rides on Election Day. I learned many moons ago to never predict what the Metro Board may do, but let’s just say this one seems to have a good chance at being approved. •Elon Musk went to Twitter to say The Boring Co.’s first tunnel is done — this is one in Hawthorne, adjacent to SpaceX — and will open on Dec. 10 with rides for the public. The LAT’s story included the phrase “many questions remain,” which strikes me as highly accurate. Musk has said the Boring Co. also plans a tunnel in West L.A. as well as one between Dodger Stadium and the Red Line. The idea is to build a network of private tunnels that will carry people on “skates” — basically Tesla-made vehicles. •The Metro Board on Thursday is also set to approve funding for a Mobility-on-Demand pilot project that would offer rides to three stations (Artesia, El Monte and North Hollywood) from nearby neighborhoods, reports Streetsblog LA. These are essentially shared rides that are subsidized by Metro for $1.75 each with the hours from 6 a.m. to 8 p.m. on weekdays. Ride share company VIA will provide the cars and drivers. Some members of the Board raised concerns about background checks for the drivers. •I personally like electric scooters and think they’re a clever way to provide short trips. But they have the same challenge as the one facing bicycling in our area: too few places to ride. The scooter companies say they don’t want customers riding on sidewalks, which is kind of like me saying I don’t want the Bengals to lose. Thus, here comes a class action suit by plaintiffs alleging they were injured by scooters, reports Curbed LA. Took this one from the summit of Mt. Lowe above Altadena on Saturday morning. I removed some haze in Lightroom but it’s still a good perspective. Click to see larger. •As for transit, you can see the Gold Line’s bridge over the L.A. River and the trestle over the Arroyo Seco on the left side of the frame. Metro’s HQ and the backside of Union Station are also seen to the left of DTLA. 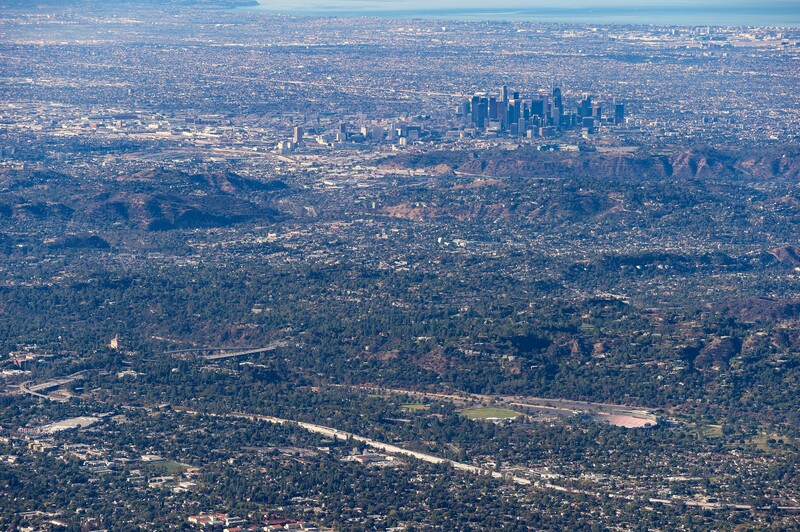 •That’s the 110 freeway cutting across the frame from DTLA to the left. Toward bottom left you can also see the Colorado Avenue and 210 bridges in Pasadena across the Arroyo Seco. •You can see the Rose Bowl, Dodger Stadium, Banc of California Stadium and the Rams/Chargers new stadium in the distance. When will audio of last week’s board meetings be available? That is a great photo, Steve. When zoomed in, the Korean Air logo on the top of the Wilshire Grand/Intercontinental is clear. I have made it to Echo Mt. before but never all the way to Mt. Lowe. Thanks for posting. When will the audio from this week’s board meetings be available? I’m waiting to hear back from tech folks. The inquiry is in.